Life coach uses her story to inspire others. Janna Yeshanova, MA., MEd, ACC, founder of Life-Spark, LLC is a dynamic and powerful life coach and trainer. Compared to the Energizer Bunny by one client, Janna leverages her passion and engaging style to help others spark the possibilities of their lives. Originally from the former Soviet Union, Janna escaped to the United States when persecution became violent during the crumbling of the Soviet state. Arriving in the United States with her mother and daughter in tow, $126 in her pocket and knowing not a soul, Janna’s talent and experiences have helped her become a premier trainer and personal coach. While in her former country, Janna acquired her Master’s Degree from Moldova State University and received a national award from the Minister of Professional Education in Moscow for outstanding work with her students. Upon arriving in the United States, she added a second Master’s Degree in Applied Behavioral Science/Organizational Training and Development from Wright State University. For many years Janna taught and trained Conflict Resolution at Antioch University, McGregor School in Yellow Springs OH. When she and her family moved to Columbus, Columbus State Community College invited her to train at the Center for Workforce Development. At the same time, she consulted for various national and international companies including Navistar International, NCR, Honda of America, Mfg., Standard Register,Lexis-Nexis and COSI. Her clients also include various government agencies and non-profit organizations. Janna’s energetic, sparkling personality has made her a leader and sought after presenter at various professional organizations. She has been active as a Director of Marketing and later as a Director of Volunteersfor ASTD Western Ohio Chapter; Dayton Mediation Center benefited from her skills as a certified mediator; she has been presenting at Toastmasters International as District Conference speaker. She also spoke at the Bosnia and Herzegovina International Peace Conference. Whether coaching or leadership training, Janna helps clients develop critical skills to support happiness and success, personally or professionally. A hot summer romance leads to a hasty marriage, a quick divorce, and years of struggling to survive the fall of the Soviet Union until the lovers find each other again from opposite sides of the ocean. 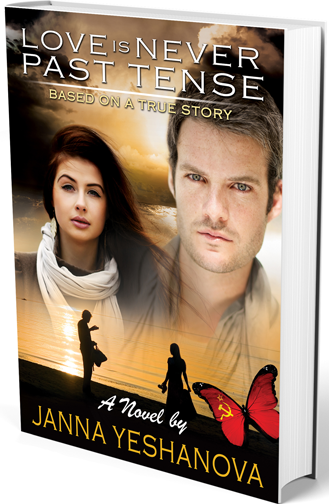 Become inspired hearing the true story of Janna’s dangerous exodus from Russia. Needing to support her daughter and mom, she arrived in the US without a job, without friends, and without any other family. She used her goals and talents successfully becoming an international author, world-class trainer, and premier life coach.